Get your job completed quick. Trustworthy and skilled crews. Get a no-cost estimate. Affordable. Your satisfaction is guaranteed. Is there a renovation project going on at your house? Need somebody to install sheetrock? Or maybe you simply want to have some damaged walls fixed. Their business specialty is building and fixing walls and ceilings in homes and other properties. They complete repair jobs, but they also carry out renovation projects, such as when a homeowner remodels a room or two. For repair assignments, they will check out your property, repair what can be fixed, and remove and swap what needs to be replaced. They work on projects in homes, multiple-unit properties and industrial buildings. 1. The drywall is brought to the work space. 3. The trash and unused material is removed, and the area is cleaned. 4. The joint seams between sheets and screws are taped and covered up with joint compound. 5. The surfaces are sanded, finished and given a texture. After the new surfaces are finished and dry, plus the closing cleanup has finished, you can move on to the painting. Nearly all homeowners will want to have them complete the whole project, but once in a while, someone wants to have them do just a few of the jobs. As an example, if you would like them to truck it over and do the installation, but wait on doing the finishing job, that is an option. Or if you have your ceilings and walls up already, they can come out and just do the remaining taping, sanding and finishing. Along with typical drywall, they can also install a stronger backer board product on the walls where you will be placing tile. They also have moisture resistant fiberglass-based boards they use in shower and tub areas. Holes can get made in your sheetrock during a Saturday night party or during a weekend football game. If your house has only a single hole, and that hole is at a spot that isn’t too visible, you may want to try to repair it yourself by putting on a patch. A wall patch is a simple treatment, but it requires a little practice to figure out how to do it right. Some patch jobs don’t turn out looking so good. And the larger they are, the tougher they are. 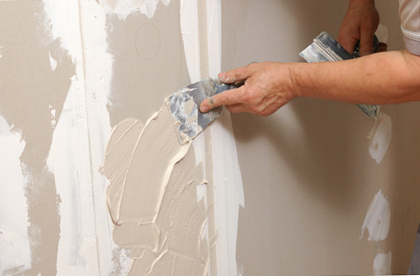 While a homeowner can install a modest wall patch in an out of the way area, it’s best if a more experienced individual take on significant repairs, or when those repairs are in the main rooms of your house. In the last day of a repair, they work on the surface of the repaired or new finishes to make certain they match well with the surfaces of the current ceilings or walls in the remainder of the room. What is Your Repair Category? Fixing an isolated simple hole or trouble area. Making multiple old or damaged interior walls or ceiling repaired and all ready for repainting. Cutting out and swapping out sections of water ruined drywall. Doing bigger size replacement of a whole room or even more. 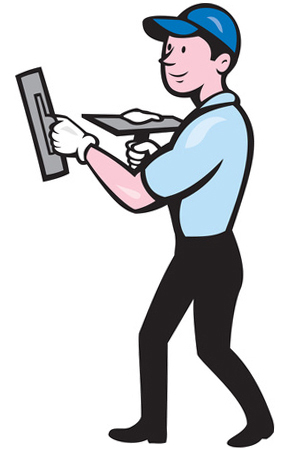 They can deal with your small defective areas, or they can conduct a complete remodel. They can do the job. You have alternatives regarding the texture of your walls. Fully unfinished surface – just taped, for non-finished work or storage areas or garage areas. Basic texture – gives a little extra depth. Complex texture – requires additional troweling and more challenging to do. Texture matching – make your replacement materials match up with your old ones. Is there a popcorn texture on your ceiling? They are able to rapidly remove and replace that ceiling covering with a more current texture. This company specializes in property interior projects such as ceiling and wall repairs and restorations. Their goal is to produce economical, dependable results. They have the best tools and equipment to get your project finished quickly and done properly. Plus they use just the top materials for your project, so they will withstand dents and be long lasting. A home improvement venture can get difficult. They will do their very best to keep the procedure steady and straightforward. Plus, they do their best to guard your possessions from harm or dust. They will leave no mess behind when they’re done. They pick up and haul out all the rubbish and scrap. They handle a selection of home improvement projects from expensive custom residences to practical repair projects and multiple family or industrial buildings. They work with local contractors, landlords and homeowners. They will be happy to speak with you if you call. They are happy to include an estimate when they can. Your cost depends on the extent of jobs you would like them to do for you and how large the whole project is. Because there are a couple of variables, the fastest way to get your quote would be to invest a few minutes on the phone. If you don’t have a plan for who is going to paint those new or repaired ceilings and walls, they are able to manage that problem for you. If you would rather do it yourself, or plan for a painting contractor get it done, that is okay with them too. Do They Work In Your Neighborhood? The service area includes almost any city suburb, including Westwind Park, Ontario High School, Chaffey High School, the Ontario Center or the ONT Airport area. They work in most city suburbs, but regularly around Westwind Park, Ontario High School, Chaffey High School, the Ontario Center or the ONT Airport area.